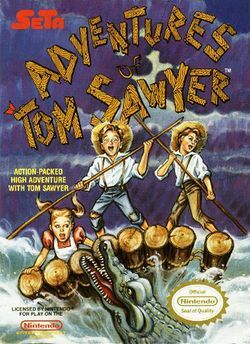 For the game of a similar name, see Square's Tom Sawyer. Adventures of Tom Sawyer, titled トム・ソーヤーの冒険 (Tom Sawyer no Bouken, トム・ソーヤーの冒険?) in Japan, is an action game developed for the Famicom by Winky Soft and published by SETA in the beginning of 1989. It was published in North America for the NES by SETA as well later on the same year. It is based loosely on the book of the same name by Mark Twain, a.k.a. Samuel Clemens. It is a platformer similar to The Goonies or The Goonies II, wherein one plays as Tom Sawyer. Inexplicably, the level order is changed in the English version (perhaps so as not to confuse players by starting with the rafting stage). The Japanese original's level 5, the pirate ship, is the English version's level 1, both making the beginning of the game much more difficult, and making the plot incoherent. Tom Sawyer is a two-player game. Player two controls Tom's sidekick, Huckleberry Finn. Huck is identical to Tom except he wears a yellow hat, shirt, and shoes instead of Tom's red coloring. The second player takes turns with the first player between deaths. The game's soundtrack, composed by Masa Konishi, is notable in that it does not draw upon more than three of the NES' sound channels at any one time. Tom Sawyer is dreaming, and in this dream he must save Becky from Injun Joe, travelling through six stages to get to her. He encounters various creatures, including a giant octopus, a giant alligator in the Mississippi River, ghosts and ghouls in a haunted house, and a dragon. He wakes up from the dream and finds himself in his Missouri classroom, where he finds one feather on his desk that had belonged to Injun Joe. It is never made clear whether or not the events of the game were real. This page was last edited on 14 March 2018, at 14:11.